In Arizona, we have some of the most strict DUI Laws in America. With the use of the breathalyzer, it makes finding and prosecuting drunk drivers much easier than it would usually be. Because of this relatively simple method of locating these drivers, it creates a virtual wealth of DUI Lawyers who are prepared to take on your case if you have been caught driving drunk. But what about those who are driving while under the influence of marijuana. For several years there have been plenty of concept devices that are dedicated to detecting this very thing. One, is the Potalyzer. At Stanford University, the students have been trying to develop a tool that can measure the amount of marijuana concentration in the driver’s blood. This is essentially a breathalyzer for pot. With two states having legalized the use of recreational marijuana, and more on the fast track to doing so, the use of this device could skyrocket within the next few years. Determining if it works or not is another monster entirely. At Stanford, the device that is currently being tested utilizes the saliva to test the marijuana concentration in one’s blood. But there are plenty of issues with this device, and they don’t seem to be getting ironed out any time soon. One obvious reason for the lack of success with this device is the absence of prior knowledge about marijuana. Of course we know what it is and what it does to our bodies, but the act of measuring it quickly and accurately depends on a certain amount of knowledge that we do not currently have. With so many different kinds of cannabis, it is hard to gauge which ones are more potent and which ones are not, therefore resulting in a different range of ways to read and measure one’s intoxication level by a simple saliva test. Of course there are other, time consuming methods like urine and blood samples, but these are not effective or useful for officers in the field. Another problem is that the science of impairment may not be determined yet. It is unsure whether or not results will show up in the saliva at all, and what if the test concludes that the person who is impaired is more “high” than they actually are. This field of study is still so new, and we do not yet know everything there is to know. The use of a device that could potentially test this kind of thing is groundbreaking, and if it works, it could become a huge industry. Plus, most states don’t even have a limit in place. Colorado does have one, and it states that the legal limit is 5 nanograms per milliliter of blood in your system. Just like alcohol, every state will have a different limit, and that will be determined when and if marijuana is legalized within the next few years. Another problem is that THC stays in your system for an extremely long time, so testing the most recent use of marijuana will be difficult. You could have smoked the weed a week ago, and it would still be in your system, which is unfortunate if you get pulled over for something unrelated to impaired driving. This is a problem because with drinking, you can spend the night at someone’s house and sleep it off without the hazard of driving home impaired. If you do happen to drive home while you are drunk, the regular breathalyzer test will catch you and it is pretty accurate. There are ways that it could improve, but it is pretty fool proof as of now. With Marijuana, however, you could smoke it at a party and get pretty buzzed from it. You could then sleep, and in the morning you will be fine and the effects will have worn off, but let’s say that you get pulled over for speeding. This is a normal habit you have and the marijuana is not affecting your driving skills at all. The officer asks you if you are drunk or high, and of course, you are not, but he suspects otherwise. And then he tests you with the “potalyzer” and it reads that you are over the legal limit. This is bad for you because being over the legal limit could mean legal repercussions and fines. So it is not a sure fire way to read current levels of intoxication, but residual ones, and that’s why a potalyzer will not be seen until it is certain and usable. 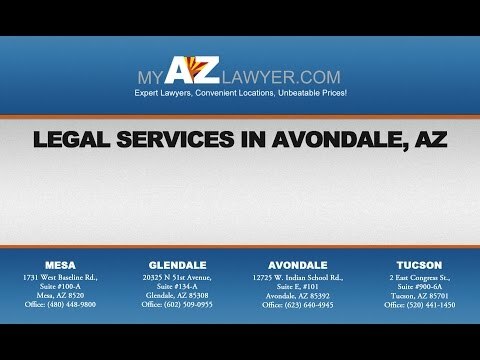 If you are looking for marijuana or DUI lawyers in Avondale, look no further than My AZ Lawyers. Our friendly professionals are skilled and effective at defending you in your hour of need. With low rates and an excellent success rate, you will be hard pressed to find better representation for your DUI or Marijuana discretions. For more information and services in Avondale, contact us today.